New technologies can often appear, at best, uninviting, or at worst, overwhelming, to older generations. With this in mind, ClarityLife Ensemble is an enhanced land-line phone which includes many useful communication tools, usually found on a mobile, but presents them in a familiar, less intimidating form. Ensemble is the latest offering from ClarityLife who specialize in smart technology for seniors. 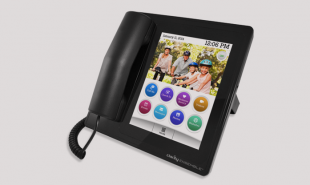 It is a communication and home health care device which features an amplified handset and a large touchscreen with a simplified interface. It can be used to make phone calls, which can be captioned on the screen if needed, and to send and receive emails, text messages and images. It also enables caregivers and loved ones to schedule medication reminders, daily check-ins and health surveys. Users can also easily send “help me” requests when they are in need. Another product offering similar capabilities is the GrandPad tablet: the device also aims to help elderly users stay connected with their families and caregivers. GrandPad doesn’t have as many features as the Ensemble but it does have some interesting additions such as the ability to stagger posts received, in order not to overwhelm the recipient, and the option to automatically harvest family photos posted onto social media sites. Are there other devices which could due adapted to better suit the needs of elderly users?